Show off your Legend of Zelda gamer style with your own hand-crafted Link hat. This polar fleece hat is simple to make and will keep your head nice and toasty on cool nights. The hat is an excellent accessory for any Link costume or cosplay event. Constructing it from polar fleece with keep it from fraying, so you will be able to enjoy your hat for years to come. Measure around your head from the nape of your neck to your forehead. Record this measurement. Make a pattern on the poster board. Draw an isosceles triangle with a 90-degree angle. The hypotenuse, or longest side of the triangle, should measure 3 feet. The short side should measure the same length as your nape measurement plus 1 inch. Draw a rectangular band shape onto the poster board. It should be 6 inches wide and the same length as the measurement of your nape plus 1 inch. The band should be the same length as the short end of the triangle. Cut the pattern out of the poster board. Lay the polar fleece onto the self-healing cutting mat. Make sure that the right side is facing away from you. Pin the pattern to the polar fleece and cut around it with the rotary cutter. Fold the band portion of the hat in half lengthwise, wrong sides together. Sew the fabric together along the long edge with a 5/8-inch seam. Sew the end of the fabric band together to create the hat band. Use a 5/8-inch seam. 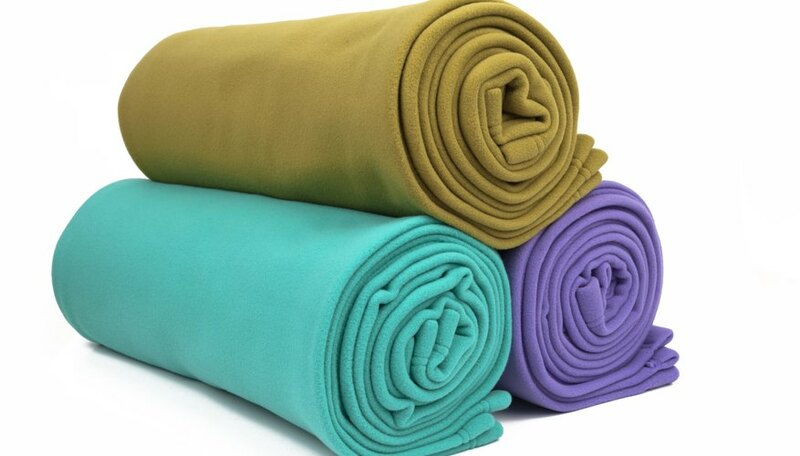 Fold the polar fleece triangle in half lengthwise so that the right sides are facing each other. Sew a 5/8-inch seam along the edge. Do not turn the hat right side out. Slide the hat band over the open end of the triangle hat section. Make sure that the seam edge is against the edge of the unfinished triangle edge, and that you align the seam of the hatband with the seam of the hat. Pin it in place. Sew the hat band to the hat with a 5/8-inch seam. Turn the hat right side out. What Do You Use to Stiffen a Hat Brim When Sewing a Hat?